Let WA PRINTING help promote your business by a handy marketing tool. 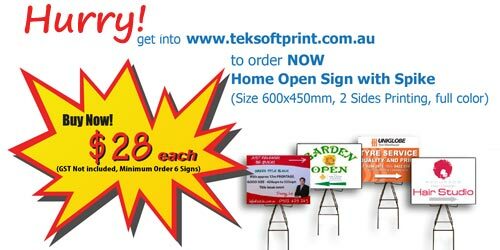 As a great way to advertise and a showcase for your business when you are on the go, home open signs with spike will help you a lot. 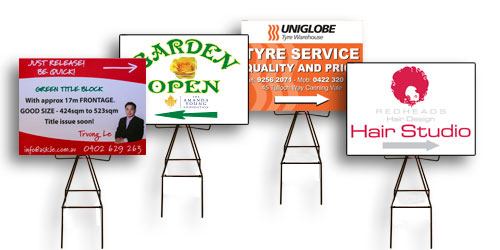 You can use them in promotional tours and attract perspective customers passing by. Printed on thick and durable corflute sign boards with your desired graphic design, each side is fully printed to maximize advertising impacts from any directions. More interestingly, our home open signs have a collection of metal and plastic spikes to support the signage. The spikes are able to be pushed into the ground with no impact on the surrounding areas, and are safely used in gardens, parks and sandy areas. For further information about our home open signs, contact our dedicated staff at WA PRINTING.